A Foodie Bibliophile in Wanderlust: Craving Indian? How About a Trip to Vancouver? 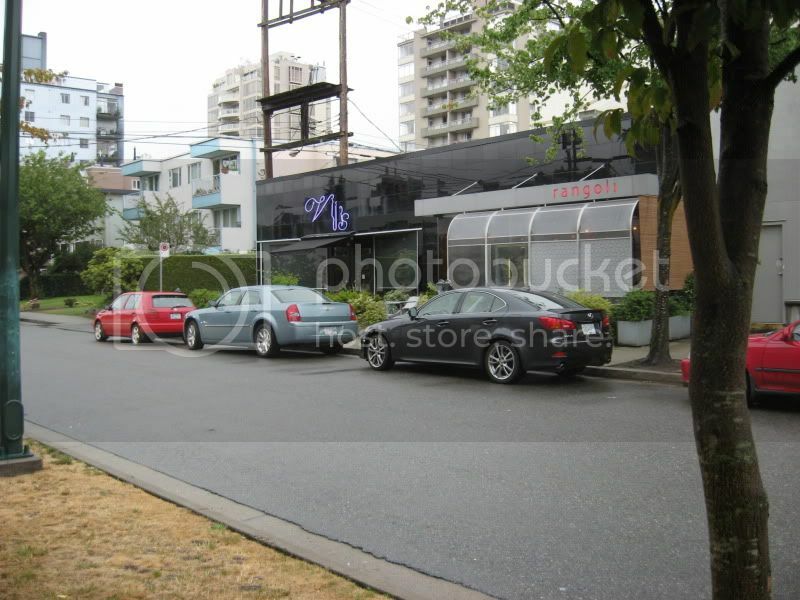 In the South Granville neighborhood of Vancouver lies an unassuming restaurant with a sleek black exterior and a purple neon sign. 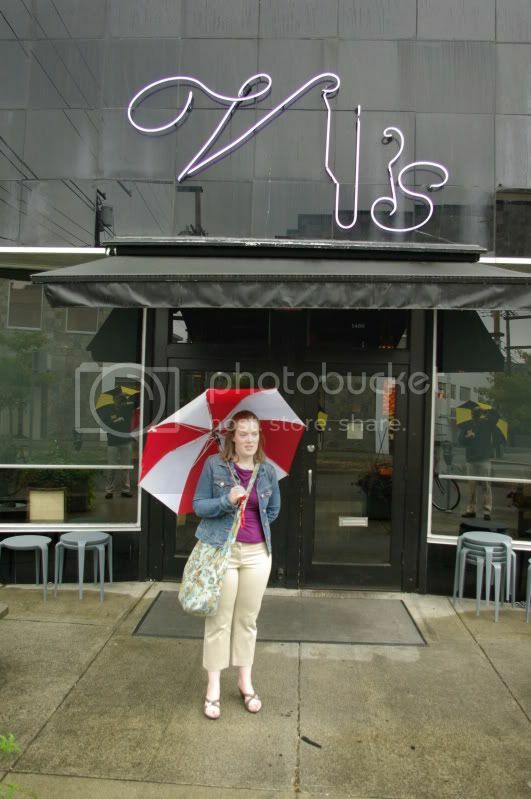 This is an establishment where patrons wait in line before the doors even open and will stand outside in the rain for hours for the opportunity to feast on the delicacies inside. 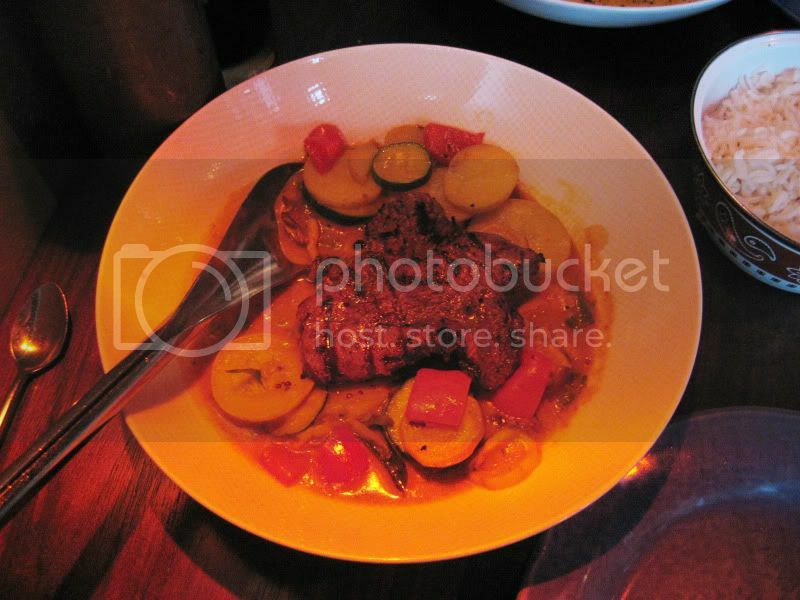 The name of this restaurant is Vij's and critics have hailed it as one of the best Indian restaurants in the world. Vij's is THE restaurant I wanted to eat at when I realized we were going to Vancouver, and was a little bit of the reason for why I wanted to go there in the first place. I first heard about this restaurant on the Pacific Northwest episode of No Reservations. But then I also saw it featured on Giada's Weekend Getaways. When she said on her show that Vij's is touted as one of the best Indian restaurants in the world, I knew that I wanted to eat there one day. Indian food is slowly inching its way towards being my favorite ethnic food so making a bold statement like "one of the best Indian restaurants in the world"? I sit up and take notice. Being such a highly-praised, high-end establishment, you might expect that it would be difficult to get a reservation. Not so. You see, Vij does not accept reservations. If you want to eat there, you must do what all the other patrons do: Line up outside the doors before they open at 5:30 and hope that you're part of the first seating. When we arrived at 4:45, there were only three guys in front of us so we chatted with them for the next 45 minutes. One of the guys was from Atlanta and he told us that when he's in Vancouver on business, he always has to eat here. He also said, much to my surprise, that Vij is there every night and he does come around to everyone's table and talks to them. Unfortunately for us, he was out of town this week so we didn't get to meet him. I thought him being at the restaurant waiting on tables was just a put on for TV when I saw him come to Giada's table on her weekend getaways show. 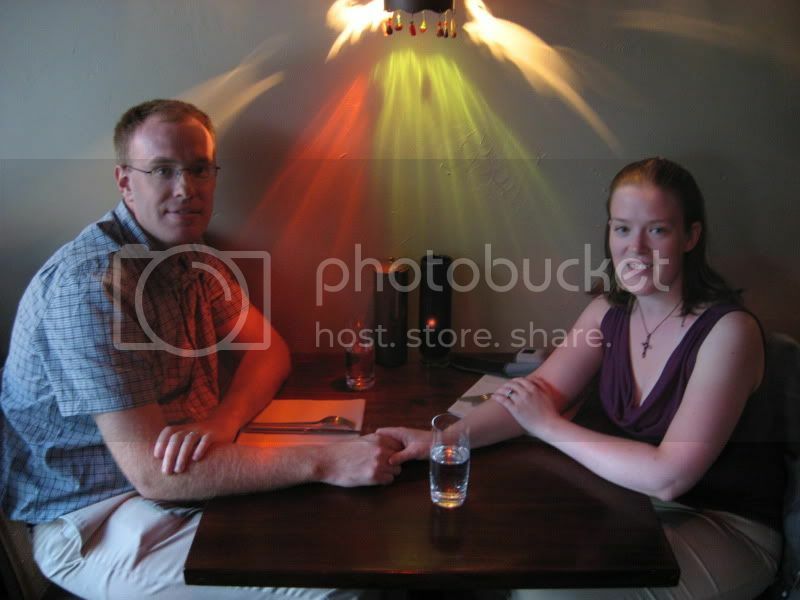 I figured he was waiting on her because there was a camera crew at his restaurant. Lo and behold, he does actually wait on customers every night. As the minutes ticked by, the line slowly started becoming longer and longer but strangely enough, everyone in line got in for the first seating. The weather must've kept a longer line from forming. 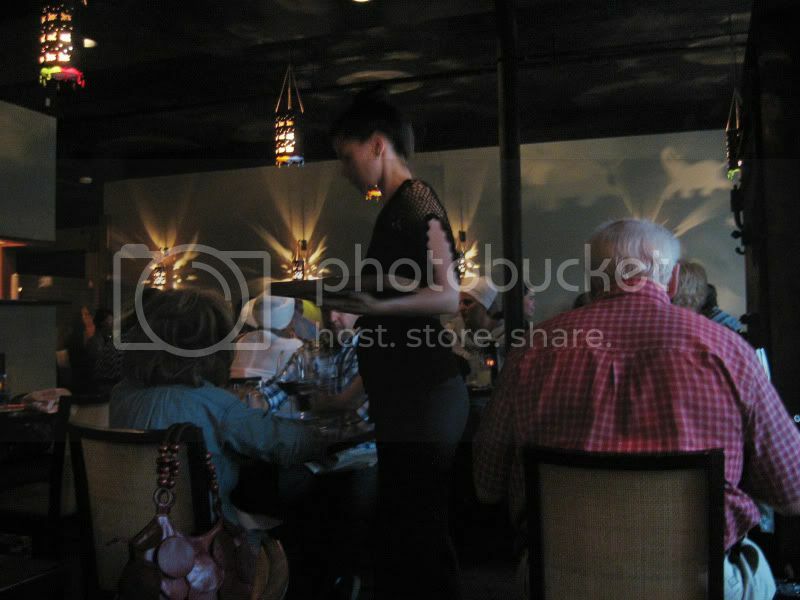 It was still a busy dining room though, and it had such a lovely, relaxing atmosphere. But let's get to the real stuff here: the food. Wow! I don't even know where to begin. First of all, when you are first seated, the hostesses come around and bring everyone a cup of chai and from that point they had me won. They had me at the chai. Once they set those warm mugs of steaming, spicy goodness, I was hooked. But they still continue winning you over even after they warmed you up from spending the past 45 minutes in the rain. They also come around and pass out hors d'oeurves to whet your appetite for the meal ahead. I honestly had no idea what I was eating when they came around because I'm not really familiar with the vernacular of Indian cuisine (other than tandoori, tikka masala, etc. ), but I didn't care because they were all delicious! 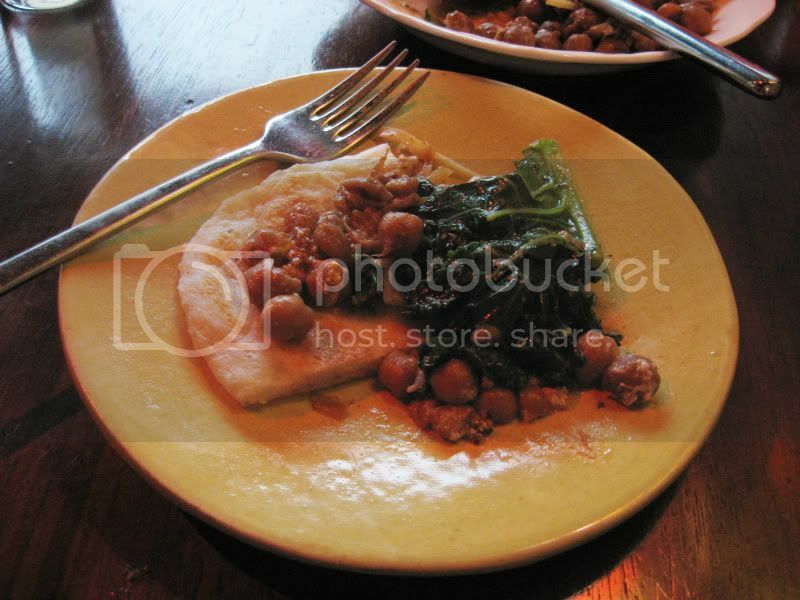 For an appetizer we ordered what is described on the menu as chickpeas in star anise and date curry on grilled kale. Now I know this probably doesn't look like much, but let me tell you, I will be talking about this dish for a long time. Not so much for the chickpeas, which were delicious enough, but for the grilled kale. After eating this, it's hard to believe that kale is usually a throw away garnish at most restaurants. Well this kale was definitely NOT worth throwing away. When I raved about it to our waitress she told us that it was marinated in lemon juice and coconut milk and then grilled. Here's why this grilled kale would turn me into a vegetarian if all vegetables tasted like this: IT TASTED LIKE MEAT! Huh? What? A green, hearty vegetable that is marinated and grilled can taste like meat? Well at Vij's it does. And now I'm going to have to try making marinated, grilled kale at home. which I thought was a strange item on a menu in an Indian restaurant because I didn't think Indians ate beef what with cows being sacred an all. But in Vij's cookbook, I read that sometimes Indian restaurants will serve meat based on the palate of the country where they're living. If they don't have strong ties to Hinduism, then serving beef does not pose a dilemma. 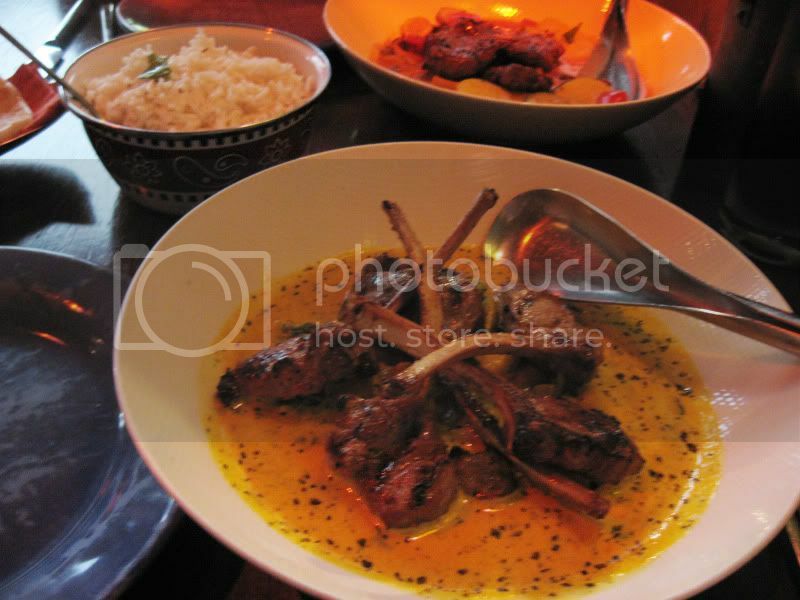 I ordered the wine-marinated lamb popsicles in cream curry on turmeric spinach potatoes. And even though I don't normally like lamb, I decided I was going to order it here because if it's cooked right, I actually like it, and I figured that one of the best Indian restaurants in the world can probably figure out how to cook it right. Well let me tell you, this lamb was definitely cooked right. It was absolutely delicious. And when you goop all that wonderful sauce onto some basmati rice and then sop it up with some naan, that made for one happy woman. As if the meal couldn't have been perfect enough, we ordered and shared a dessert of Indian pistachio doughnuts in a cardamom syrup. This also came with some chai, and I devoured mine as well as Johnathon's. I love just about anything with cardamom in it so I thought the doughnuts were delicious, but as I look back and sit here writing about this meal, it was about the experience just as much as the food. 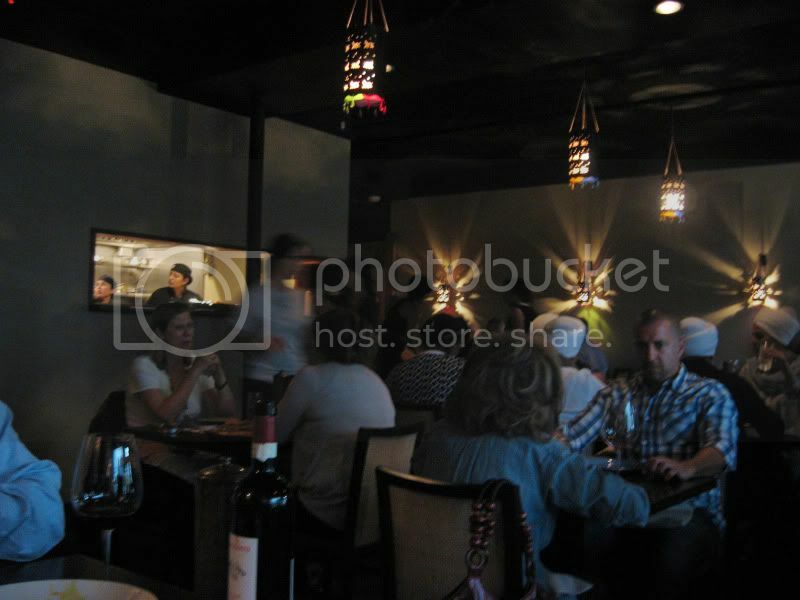 All the people who worked there made sure that everyone had an enjoyable dining experience. From the moment they bring out the chai when you first sit down, to the offering curious customers insight into how the food is prepared, you got the sense that they all really wanted you to have, not just a meal, but an experience you'll never forget. If we ever go back to Vancouver, we will definitely be going back, and I will, once again, happily wait in line for my dinner. And now that my mouth is watering from writing about all this outstanding food, I'm dying for some curry, basmati rice, and some naan to sop it all up! 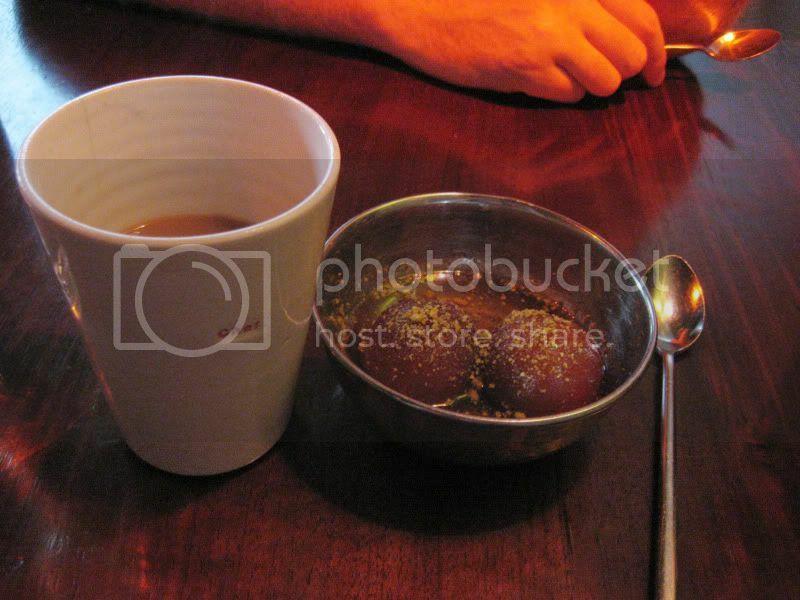 Oh yeah, and some chai too!